Body Merry Retinol Surge Moisturizer Review (2018): Does It Work? Body Merry Retinol Surge Moisturizer Review: Is It Safe And Effective? What Is Body Merry Retinol Surge Moisturizer? The product Body Merry Retinol Surge Moisturizer is part of the full range of Body Merry treatments and designed to reduce lines and wrinkles while also controlling acne and other skin problems. The product is marketed through the Body Merry website and consumers can purchase it directly from the manufacturer. The regular cost of the cream is $39.99 but it is sometimes offered at a discount price of $20.99. Customers can get further discounts by joining Club Body Merry and all purchases are covered by a 90 day refund and exchange policy. Body Merry Retinol Surge Moisturizer– Does It Really Work? What Are The Ingredients In Body Merry Retinol Surge Moisturizer? Does Body Merry Retinol Surge Moisturizer Have Any Side Effects? How To Apply Body Merry Retinol Surge Moisturizer? The Body Merry company produces a wide range of skin care treatments and presents them on a website which has a fun, upbeat tone. In addition to providing information and videos on each of their products, they also offer FAQs, all customer care contact details, a skincare blog and full ordering information. Although Body Merry isn’t one of the more well-known skincare companies, they seem to be featured often in the media and women’s magazines. Body Merry Retinol Surge Moisturizer contains an amount of the powerful antiaging ingredient Retinol, known for its benefits in encouraging skin cell turnover, production of collagen and brightening effect, all factors that give the skin a youthful appearance. It can be used on all skin types but is particularly effective on skin that is prone to breakouts and acne. It is said to also have the ability to fade acne scarring. 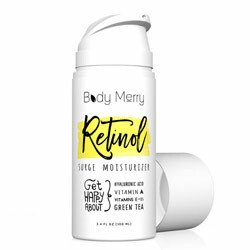 Although Body Merry Retinol Surge Moisturizer should not cause any detrimental side effects for most people, Retinol does have a reputation for irritating very sensitive skins. Anyone with this skin type should do a skin patch test before applying the cream. For people with oily skin types, Body Merry Retinol Surge Moisturizer can be applied twice a day in the morning and evening. For those with dry skin, application once a day in the evening is sufficient. Anyone using Retinol for the first time should use the product every other day to start. Body Merry Retinol Surge Moisturizer would be a good choice for anyone who wants an antiaging product but also deals with oily skin that breaks out occasionally. The use of Retinol in the formula means that it will provide protection against lines and wrinkles and give the skin a more youthful appearance over time. However, consumers should use Retinol with caution, especially if this is their first time or if they have very sensitive skin. Considering it is not one of the better known brands, Body Merry Retinol Skin Surge isn’t the most affordable product on the market when purchased at full price so consumers would be encouraged to join the company’s discount club for savings on their products.